If there is military action against Syria, should the U.S. be involved? As Syria's brutal crackdown intensifies it seems increasingly likely that there could be some sort of military action. The United Nations is calling for the international community to protect the Syrian population. One opposition group reports that government forces killed more than 130 civilians in Syria today - most of them in the city of Homs. There are reports of bomb explosions every few minutes; of wounded people bleeding to death in the streets because they can't get help; and of snipers picking off civilians who are running for cover. Doctors inside Syria say government forces are targeting hospitals, medical staff and patients. Meanwhile the Pentagon and U.S. Central Command have started reviewing military options. One senior official calls it a "scoping exercise" to see what's possible - given all our other military commitments in the region. It's not unusual for the Pentagon to do such a planning exercise - so they have options ready if the president wants them. They're likely considering everything from humanitarian relief to support for opposition groups. Senior officials tell CNN that outright military strikes are unlikely. Some have suggested setting up a "humanitarian corridor" or safe haven for civilians. That could require the use of troops. Others, including senator John McCain, have said the U.S. should consider all options "including arming the opposition." The State Department says while they never take anything off the table, they don't think sending more arms into Syria is the answer. It's believed that any military action in Syria would be riskier and more complicated than the Libyan mission. And a lot of people don't think the U.S. should have gotten involved in that. Here’s my question to you: If there is military action against Syria, should the U.S. be involved? Absolutely not! BUT as usual the US will be pressured to get involved as per Libya. Where is the new Arabic Saladin? Where is he? If the US can prevent massacres and holocausts anywhere at any time, we have a moral obligation to do so. With the diplomatic skills of the President and Secretary of State we would not be acting alone. Did the Congress declare war? Then no. Why is it so hard for politicians to follow the law? And why should Americans put up with those that don't? You mustbe smoking something illegal to come up with a question like that. Have we learned nothing from Vietnam, Iraq or Aghanistan? The middle east is a culture of its own and totally resents any help from the west. What is it about the Unitied States that they can't understand that the middle eastern countries don't want us there or our help. Its time to worry about the future of the U.S. and let the middle east countries solve their own political problems. Jack: The United States is still conducting a war in Afghanistan, and the citizens of the United States in every poll are tired of the wars. The soldiers, marines, airman, and sailors have done an outstanding job under very harsh conditions. If we could change things in Syria in maybe 3 or 4 months with air power it might be something worth looking into by the USA. The cost of war in blood and treasure has been great, and only 1% of population of the United States is effected by these wars. We are still recovering from some bad economic decision made 10 years ago. Boots on the ground means more tears and more sacrifice by young people in the military. In general the answer is no. We might, however, offer specialized support similar to what we did in Libya. Saudia Arabia, Jordan, Turkey and Eygpt all have Air Forces that should be able to counter anything the Syrians have to put up. This should be mainly an Arab League response to a rogue dictator. Absolutely NO! The USA needs to stay out of this one. No. None of our previous involvements have accomplished anything of value to us or the nations whose business we butted into. We lost thousands of lives and added trillions of dollars to our national debt. Let the Arab nations such as Saudi Arabia handle it this time. We've sold the Saudis top military equipment over the years and taught them how to use it. Let them use it for a worthy purpose now. If this were the Bush era, I suspect there would already be plans for direct action against Syria and Iran and saber rattling. Of course, no good will come of direct action to either. No, the United States cannot get involved in every problem area in the mid-east. Our record is of interference and does more harm that good. And anyway, aren't troops worn out. I doubt if civilians will sign up for such a new "adventure"
OMG!!! Are you serious, NO NO NO NO NO! I am sorry for the innocent citizens that are being murdered, but please we cannot help this time. We are broke, we need to help people here and stop trying to police the world. We are not the only military in the world, can't someone else help. Everyone sits back and waits for us, not that I can blame them because we are always stepping up to the plate, however not this time. Someone else needs to bat. Not boots on the ground. I don't have any problem with advising other Arab countries that would be willing to intervene militarily or providing supplies to the rebels the same way the Libyan rebels were supplied..
With the debt and huge budget deficit–the US should be cutting the military, mothballing ships, tanks, and planes. As long as most want to cut taxes for some group–there should be no military action at all anywhere. If the US wants to get involved in any military action, then raise taxes significantly on all groups. Raise taxes enough to pay the costs of the wars and to reduce the budget deficit significantly. If there is U.S. involvement, it should only be in the background as a supporting character. There are plenty of nations in the immediate neighborhood of Syria that are capable of fighting this battle. We can't afford to be the world's police force. Everything in this scenario depends heavily on the WHY there would be US military involvement. Syria is one of 3 major geo-political fault lines in the world right now. It is also the most active and could quickly destabilize. The only reason, from a cold and pragmatic geo-strategic point of view, to intervene in any way, would be to prevent the complete destabilization of the region. It's one thing for Syria to engage in civil war for the next 1-5 years. That would be tragic, but ultimately not in our interest in intervene (and draw the ire of Russia, China, Iran, making those relationships even worse). However, if the Syrian civil war becomes a truly sectarian affair, and begins spilling into neighboring countries like Iraq, Lebanon, and perhaps even Israel, an intervention to restore order might have to happen before the situation quickly devolves into a Third World War of sorts. I realize that being the American Empire is hugely unpopular in today's political environment. I am as tired of war as the rest of you. But empire is all about keeping global order. It's why we pay for this ridiculously large military. In the event of a major destabilization possibility in Syria and beyond, if there were massive support from NATO, UN, and the Arab League, I could see and might even support US military assets deployed to stabilize the situation. Of course, like anything else, it would depend on conditions on the ground. Though I would never vote to go alone. If no one else supported it or was willing to deploy the fullest of their capabilities, I’d argue strongly against it. At that point we should fortify the home front, and hope for the best. The U.S. military should not be involved in any way shape of form. If the international community wants to help the Syrian people, then the international community should step up to the plate. The more than efficient United Nations and Arab League are more than capable of handling a problem like this. NOT. This will be a good learning excercise for them to start with, they have shown over and over again that they are not able to control one mad man dictator. But training and experience will overcome this deficiency. Only as outside support of intelligence, arms, and advice. It's time for the Arab League to take care of it's own for their own sake. Let me start by saying, not one boot on the ground! Secondly, Obviously being insanely rich does not bring forth honor nor intelligence. The Arab nations are not civilized, and won't spend a cent or lift a finger to help the common citizen in their respective countries, something the Republicans are trying to do here! The United States is a world leader and must initiate any response to make other countries get involved. We have once again garnered respect from the rest of the world after the Bush Administration destroyed foreign relations. As if we didn't have enough cause to take out Al-Assad, it would further demonstrate to Iran, we're not taken their BS any more. Air Force and navy can take out their Command and Control and then, "being an Air Force Family, I can't say enough about our Drone Program, it saves lives and allows us to do our job and not risk Boots On The Ground! So , to answer your question, Yes, this tyrant is as bad as Saddam ever was! And this time the Arab League needs to show up! Only if the other Arab nations decide to take action and ask us to get involved. Our habit of attacking Muslim nations for their natural resources, under the pretense of spreading our idea of democracy, has to stop. Let's spend billions of dollars and hundreds of young naive, innocent American lives in another lunatic hell hole where they can spit on our graves, burn our flag, and hate us after we leave in a daze of ignorance, wondering why we got involved in the first place. No problem, this is what the "Dumbing of America" is all about. Absolutely not! We should quit trying to be the meddling mother-in-law of the world. Haven't we already caused enough death and destruction in that part of the world? Despite Pentagon and Republican spin both Iraq and Afghanistan are much worse off now than they were before we invaded. As with most meddling mothers-in-law, no matter how good out intentions we always seem to make things worse and end up with the people we are purporting to help hating us for it. Leave well enough alone. I don't think the US should be involved in anothér in the next 20years as that of the last 10 years has damaged her economy and the whole country is grappling to stand tall.The US should not be involved millitarily for the next 20 years. I don't think the US should be involved in anothér in the next 20years as that of the last 10 years has damaged her economy and the whole country is grappling to stand tall. No. The only concern America should have is humanitarian Aid. There are 195 other countries in the world Jack and one or two of those can step up and assume the roll of big brother. Other then food and medical assistance America needs to stay out of it. Jack, we live in a capitalist society, why wouldn't our for-profit military industrial complex get involved? They have shareholder's to answer to. Screw the soldiers and innocent civilians, bombs away, there's money to be made in them-there deserts! Only if we have military conscription, (The Draft of our young). The Vietnam war demonstrated how questionable it was by those who would be called to fight it. War should never be questionable, and there must but a absolute positive reason for our dead and wounded. Since eliminating the draft, all our military actions have been questionable, and we go on asking. The only way we should get involved is with drones and supplying the rebels with weapons to counter the Russians and Chinese supplying the Syrian government. We are stretched too thin and are in too much debt to do anything else. For over a decade we have seen our servicemen and women come home in body bags and wheelchairs. It is time for other countries to be the policeman of the world. That is up to the Arab League to do something about. We have been fighting too many battles for those in the middle east. Let them fight their own battles. Isn't America's main objective to promote and spread democracy? People in Syria and the Middle East have been told for years that they have democratic governments when in actuality it has all been a facade for corrupt dictators to be re-elected by surprise, themselves over and over. Its time for the world as a whole to stand up for the freedoms that we and other European Nations have had for so long. The United Nations should stand up and show their commitment to the world by intervening on these reckless atrocities of murder of men, women, and children. Time for us to stand up for what is morally right and not be afraid of so laughably called democracies such as Russia and China. Sure, why not, what else have we to do? And I'm pretty sure a Cafferty file comment is enough authority to go in these days, get-r-done. We can't afford to be involved for several reasons. One, we are broke and buried in debt. Any money we spend will be borrowed. Two, the Middle East is a quagmire. We will always be the invaders, the infidels, the baby killers and there will be innocent death either from air attacks or ground assault. This could be a great excuse for the third world war. Three , the disruption in oil would plunge the world into chaos. This is another reason we need to quit fooling around and get energy independent. Syria has a huge population and almost everyone there has a Kalashnikov. It's dilusional to think democracy is alive and well in Iraq and Afganistan. America is broke, so the answer is NO. The money printing press is on the verge of a break-down already. Take care of America first. Only if it is done the same way we handled Lybia – no boots on the ground, no blood shed. Go as far as we've done for Libya, and no more. Jack, I just left a meeting of retired bankers and they enlightened me how the banks are making all their money, without risk. They refuse to loan any money, which exacerbates our economic dilemma, but borrow from the Fed around 1% and then buy T-Bill's around 3% with no risk. If this is true, we are all screwed. Jack, if the U.N. approved it, yes. But, that's not going to happen. NATO won't do it, because budgets won't allow it. So, the best answer is to help arm opposition forces and use covert action to destabilize the Assad government. We saved the world in the 40s. We saved Korea in the 50s. We "saved" Viet Nam in the 60s & 70s. We "saved" the Balkans in the 80s. We saved Kuwait in the 90s. We "saved" Iraq and Afghanistan in the 00s. We already "saved" Lybia and Egypt in the 10s. Damn, Jack, it's somebody else's turn. We're broke. How many wars does it take to satisfy the war-profiteer corporations and their billionaire human owners? Iran, Iraq, Pakistan, Yemen, Afghanistan, only names the ones we know about how many more are there? What about the 60+ drone bases around the world and in the U. S. which have been used against at least one American citizen. The congress will not pay for these wars just add it to the national debt and weep we have no money for food, health care, jobs for Americans building roads and green energy etc. I don't have a clue who the opposition is that Assad is trying to wipe out. I haven't read any reports from the News, or the State Department via the news, who the opposition is either. So I wouldn't send any Military support Untill, 1. I knew who it was we were protecting, and 2. That the leaders of thesae folks publicy asked for our military support, and, 3. That these folks guaranteed somehow, that they would be friendly with us, if they were able to topple Assads regime. My guess would be, that our Government will have a hard time pinning these folks down on these issues. Doug, Pepperell, MA. NO ! NO !! NO !!! we'll NEVER get OUT !! What, so we can be drug into another War, for another 10 years ? Jack, I can't believe you'd ask such a Question. NO! We can't even get our own house in order. Why should we be trying to tell other people they're or they're wrong? This should not even be up for discussion. Syria is an Arab League problem that Muslims need to handle. We are the Great Satan, remember? The Russians already have a naval base in Syria and have deployed an aircraft carrier and other elements of its Northern fleet to the area. Iran has sent a few hundred of its special forces to fight the activists and is in the process of sending a larger force to reinforce them. Russia and China would probably support a cease fire, monitored and enforced on all sides by an international force. I would try non military strategies like this. The US was involved in Kuwait, Iraq, Afghanistan, and Libya already - I think we should stand down from further military involvement in the region at this time but push other policies to stop the bloodshed. If Turkey or the Arab League want to pursue a military action, I would not join them. It will only create another Libya – there seems to have been a lot of killing and torturing of civilians since Quaddafi fell. Not another war, please!!! The U.S. can't afford it ... money-wise or forces-wise. It's time to attend to your own people who are in dire need. Stop this riding to the rescue of every other country but your own. It didn't work in Iraq and it didn't work in Afghanistan. They still haven't a clue as to what democracy means. No the U.S. should not be involved. This is a good time to set an example to the rest of the world that we are not going to police there countries and solve there problems for them. By no means should the U.S. even consider military action in Syria. It's time the country sits back and lets its wealth return. The American focus should be on rebuilding itself domestically. A UN peace keeping mission might be the best option, or intervention from Middle eastern countries. However, eventually the people of Syria should be able to bring down the government on their own. Why not? It will be the perfect prelude into Iran, waiting in the wings a few months from now. Alas, sometimes I think we should give up on everything else and become one gigantic "military for hire" state. (Our young are already in training for it, with all their DVD war games.) With as much trouble as there is in the world, we will be "operating in the black" in no time! Like they did back in WWII, we could all pitch in and do our part to contribute to "the cause." We'd all be employed and no one in the U.S. would be in need for anything. Hey, don't blame the messenger! The people of Syria are suffering and deserve to live in freedom with a democratic goverment that reflects the people's will. However, it is not our responsibility to fight for their freedom and independance. We can no longer be the policemen of the world. We need to take care of our own problems and not spend billions of dollars and risk numerous american lifes to overthrough the Syrian goverment. What if China, Russia, and Iran side with the Syrian goverment? What type of goverment will replace the current Syrian goverment? We need to sit on the sidelines and let the chips fall where they will. The only correct answer is NO. It's time for the Arab people to take care of their own.The onus is on them. We should only provide humanitarian aid. Let's allow Arab leaders in Jordan, Lebanon, Tunisia etc to coalesce and do yhe right thing for their Syrian brothers and sisters. I really don't see how we can, Jack. Syria ia not a country with a shoreline like Libya so any air action would require permission from either Israel, Lebanon or Turkey and I doubt that would happen. the ideal situation would be for the Turks to get involved. 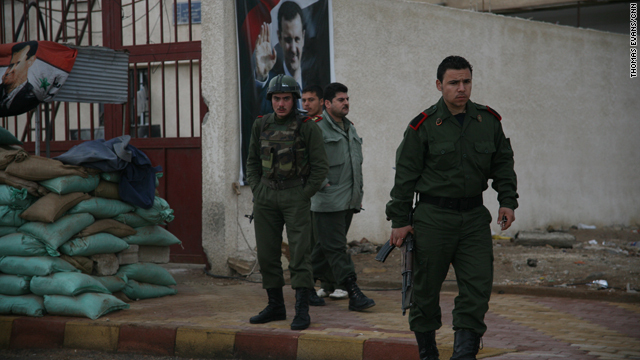 the problem is on THEIR border and they have the military to counter the al-Assad loyalists. question is, WHAT would it take for them to intervene? need some of that Obama administration "diplomacy" with the Turks AND the Arab League like they pulled off in Libya. For humanitarian purposes, yes the US should be involved. But if it's military support and military on the ground, it's time for the Arab League and Arab countries to do the dirty work. The US can provide logistical support to them. no. we have been in enough wasrs already. lets keep our troops and money at home. it is time to invest in america and our people at home. not abroad. No. As detestable as the syrian president is for order the killing of his own people, the United States has no business entering itself into a new war when we still in the process of ending the second of two wars we have been engaging in for almost 10 yrs. I think this is a problem for NATO not the US. Although I do think President Obama should verbally support NATO's effort and only step in with force if absolutely neccessary. This a country that has been bankrupty by uneccessary wars, and a country that has grown weary of war. A most emphatic NO! What happens in Syria has no effect on American national security. In a worst case scenario, what does the U.S. do when Syria's allies choose to intervene? Taking on Russia and China over Syria would be disastrous The minute we become involved in Syria our friends in Iran will be up to no good. Our military is not big enough to battle on three fronts.. I doubt that ANYONE that responds to this question is actually qualified to do so. I trust our President and his advisors to respond in the most appropriate way...but I am sure that his detractors will blast him all over the media no matter how he responds. So sad that they care more about party politics than they do the well-being of our nation and the world. No, we should not become involved in Syria. We should also get completely out of Iraq and Afghanistan and all of the other countries around the world where we have troops. Bring them home to bases in this country and let them spend their money here. NO! We've had enough. We should start minding our own business unless we have agreements already in place or our national security is truly threatened. No, we are not the world police. Let their Arab brothers help them this time. US involvement should only be with the United Nations. We do not need to spearhead another middle eastern war. We must be careful not to let the Republicans take us into war -- they never seemed to meet a war they didn't like. Be cautious!! NO! It should be handled by the countries in that region. The U.S. cannot afford to get directly involved in another mess over there. We need to stop being the world police, that is what the U.N. and it peace keeping forces are for. NO. Last year we watched Egypt overthrow Murbarek. Now they put Americans in jail. Didn't we do this once? You know ,Vietnam. Get Engaged in a war with a soviet Surrogate that became a testing ground for the superpowers new weaponry and hardware and accomplished Nothing! There's nothing to be gained for us there! Stay out! Jack, Syria is a true sponsor of terrorism and I would support taking that regime down. If it is done, however, I vote we do it the way it was done in Libya, let the Syrians and other Arab states do it themselves and we'll support them with technology and air support. Jack, I know this would be.a tough call, however, base on how the president operates it would have to be clare for him to make such a decision. The world is tired of war now, he is not a war apetite presidentsoto go into war now would e a big question. Iraq was wrong, but if this president sees it right I know he will hit hard.I am sure he has to do so he will be able to sell it to the world without a problem. "Involved?? Physically? You're already involved! The moment you comment like this, you're involved! If you supply any weaponery you're involved. " The real question is, if there is military intervention, "who's going with us?". Its such a difficult dilema. On one hand how can anyone stand by (except China and Russia) and watch the daily murdrers without taking action. ON the other hand, why is it always US first and only. You know, once this grows its time for Iran, then what? Not easy decisions, no matter what the outcome. It does not end in Syria. Sure. Isn't it a rule that we now involve ourselves in at least two Middle East conflicts at a time ? No. Let the united arab league take care of their own problems. Jack: If there is something, in which the US will get a return on their investment (Oil),--you can assure the US will get involved-–but not for the reasons that will be pubically released. Mr. Cafferty: If you had a strong President you would still have the ground and air troops in Iraq to easily undertake the mission. Since Turkey is the only other neighbour who could invade, it would cost them dearly in human life. The only answer is Special Forces sent in to kill the regimes middle bureaucrats and army officers. These have no protection but are needed to keep te regime working. By keeping the afraid to move, the rebels would succeed. Only get involved in an action where the Hashemite Dynasty is restored to Damascus and then only at the request of King Abdullah. Our economy itself is in a life or death situation for many Americans and no one is coming to bail us out. As much as we all hate to see what's unfolding in Syria if we continue fighting wars for other countries we won't be able to fight the war of poverty and jobs in our country. Let's vote for the Russians and Chinese to do the heavy lifting in Syria. They can find out how effective the weapons are that they supplied to the Syrian government. No and if the idiots want to use force let them go over there, we've lost enough American soldiers for the benefit of the defense industry and the worthless congressmen that gets their pockets stuffed with money from them. Let France and some of the European countries sent their troops over there. “The United Nations is calling for the international community…” READ; “Uncle Sap.” But I say, Hell NO! How much more damage do we have to do to ourselves on every facet of our existence before we get it through our thick skulls that we no longer have the financial wherewithal, even if it was a good idea – which it absolutely isn’t – to get involved in playing God with other sovereign states? Well, after Aghanistan, Iraq and Libya, millitary action in Syria would keep our wars in alphabetical order, but I thought the NeoCons wanted us to go to war with Iran next. No, but that won't stop the chicken hawks in Congress and on the campaign trail from saber rattling. If it were their children fighting in these wars, they wouldn't be so quick to make our troops the world's police men and women. Any member or former member of Congress who promotes military intervention in either Syria or Iran should shut up, suit up, and go join the fight. You can count on one hand the members who in the past were brave enough to do that. They know war is hell, not a game to make their campaign contributors richer. Jack, we absolutely should NOT get involved in Syria. We are not the world's police force, and our soldiers are not cops. Case in point, look at how they are being used in Afghanistan. And, Iraq. And Bosnia, And Vietnam. And, by the way, could you let the Plutocracy know that wars must be paid for. Thanks. We should be ashamed of our selves for watching and doing nothing. We the people should humble ourselves and offer our help with United nations approval and guidance. We don't have to be a first there, first pay, first everything let's share the sacrifice and the cost. It would strengthen the worlds eye to see a united "Peace Force" handle governments as deadly wicked as Syria. If the goal is to get al-Assad out; make him a deal. An eye-doctor by trade, he never wanted the political job to begin with, but was coerced by his father's Alawite advisors and entourage so they wouldn't lose power. It's the U.N. that needs to get involved, the Syrian opposition requests for help are directed at the U.N. As for China and Russia, it's time for the United Nations to tell them where to stick it; two countries should not have the right to tell every other country in the U.N. what the world can and cannot do. Those in Russian and China who seemingly condone this slaughter, along with al-Assad, will eventually have to answer to God for their actions (or lack thereof). As for the U.S., we've obviously had enough of war, but humanitarian aid should always be on the table. Not with ground troops. But if a drone could spot Assad and blow him into Hamburger Helper, I'm sure the most of the Syrians would applaud us. the United States sold weapons to the Mexican Cartels so why not to the Syrain Resistance? Of course the US should be involved if there is action taken against Syria. America can’t pound its chest and proclaim itself as the “brightest beacon for freedom and humanity in the world” and claim to have “the most effective military force in history”, and then sit back and watch thousands of people get slaughtered while not lifting a finger to help. Spiderman’s uncle said “With great power comes great responsibility”. Wise words. Only as part of a NATO operation and then only if authorized by the UN. Absolutely not! We've lost too many young men and women in wars that are meaningless. Are you kidding me? We're already in over our heads in our dealings with Afghanistan and Iran, and Iraq is falling apart as we speak. How can military intervention overseas even be on the table? We are 14 trillion dollars in debt. This isn't the time for another multi-billion dollar expenditure that will cost the U.S. more than just an inordinate amount of money to do nothing for national defense- but lives of American citizens, as well. NO!!!!!!!!!!!!! Stay out of it. We can not afford to Police the world!!!! The Syria situation is going to change the way the world thinks about democracy. Everyone has a right to it, even if they're the minority in some countries. I believe that we should Seal Team Six arrest the Syrian leadership and drag them to the Hague. If the U.S wants to remain as a world leader then yes. You cannot simply stand by and watch a dictator murder his people, and call yourself a world leader afterwards. Jack, Why would you even ask that type of phrased question? It's more like, When will the U.S get involved! That entire area is a tinderbox, its just a matter of time before it's all up in flames. Sorry the truth hurts sometimes. Yes, it would be really nice to take some military action, for the right reason instead of the criminal acts that we have been pursuing in Iraq (oil) and Afghanistan (mineral wealth). Our involvement for humanitarian reasons would give the American people something to hold thier head up high, instead of low and in shame when they travel over seas. Thing like this could be the first step in restoring our place in the world. I believe we have a moral obligation to help the Syrians. Their ruler is oppressive, not because he isn't democratic, but because he's been killing hundreds of people. Not only do we as citizens in this global society have a moral obligation to help those in need, we need to help because they're asking for help. It's as simple as that. Saving human lives is the most important thing to be focused on. I believe the US should. If the action is approved by Congress or takes less than 60 days that is. We need to stop thinking about politics when it comes to innocent people being killed, anywhere. If we are a nation that wants to protect democracy and let it flourish, we should stand by our words and founding documents and let freedom ring. "If you talk Corridor's, there is only a north-eastern direction. You can't go into Jorden, nor can you go south and get Irael involved; so there is only one choice left and that is Turkey. They have no religious ties with Syria, would relish the input, providing they are re-embursed!." Absolutely no military involvement, especially with Russia and China standing in support of the current regime. I emphasize and feel for the Syrian people, but its time for other countries around the world to lead interventions in humanitarian crises. For once the United States should let someone else lead the way and just offer support if its direly needed later on. NO. This country cannot afford, in relation to monetary policy and foreign policy, to be the policemen of the world. We can't continue to spend taxpayer money overseas and we can't continue to discriminate on what countries we help. There are people being killed all over the world, but we pick and choose who to help. Simply shameful. The U.S. should be involved with attacks on Syria. Not only is it the right move to make, it will strengthen the U.S. image around the world. The U.S. should have intervened much sooner, the Syrian people are being ruthlessly attacked by its own government. We should not spill one drop of blood or spend one penny in syria or any of these countries that hate us. In my view we should sit back at let them kill assad and see if they still hate us once he is dead. Yes, but only as part of a greater respopnse by NATO and Arab League. This is a massacre and we have a responsiblity as people to stop it, like with Bosnia, Libya, Nazi Germany, etc. We can not just stand by, knowing what we know, and do nothing. Didn't the Neuremburg Trial teach us anything? Of course not, the United States needs to stop being the police of the world. We cannot even fix our own problems so why do we feel it is necessary to fix others'? We need to re-evaluate our priorities and focus on rebuilding the American economy. No way! Which money is going to support yet another military engagement? At this rate, our only export will be military assistance and war. How about investing all that money in manufacturing, so that we have something else to sell to the world? Last year, Egypt was the template for how peaceful revolt and government overthrows should be done. Then we saw Libya and all the Europeans go nuts over where they'd get oil if the colonel was taken down. We took the backseat as we should have and now again, people want a bad ruler to be taken out of power. do it as Egypt did. protest, and when beaten, wear your bandages with honor. that will hurt the government more than a UN sanction. If more than 10% of Americans can find Syria on a map I will support getting involved. Every time this happens we say it's time for someone else to step up, and every time we still end up doing the bulk of the work. Might as well just get it over with now, at least it'll stop the senseless bloodshed. Absolutely not. Contrary to popular opinion, the violence in Syria isn't unilateral- the opposition army is also attacking the government military. Given Russia and China's anger over our involvement in Libya, the last thing we should do right now is get involved in a civil war. The era of U.S. nation-building is over and we should stop believing that we can solve a country's political problems through military interventions. The best thing we can do right now is to continue to apply diplomatic pressure on Russia to strike some sort of deal with deal whereby Assad PEACEFULLY steps down. I am honestly torn on this issue. On one hand I feel very deeply for the people of Syria and have great disdain for what Assad is doing to his own civilians. On the other hand, a military intervention could have devastating effects across the region, which is already in turmoil. At the end of the day though, something certainly needs to be done about this and the fact that Russia and China are stone-walling a UN intervention disgusts me and tells us a bit about Russia and China themselves, but is not surprising in the least. It is terrible what is going on in Syria, and other parts of the world right now. However, I don't think that more violence and bloodshed in another war that no one wants is the answer. I still believe we should do all we can to help the Syrian people, but military intervention on our part would probably do more harm than good; and I believe any such intervention would likely be viewed as another unwanted encroachment of the United States of America into the middle east. NO! NO! NO! Why should we lose our good men fighting for people who hate us. Absolutely. Bust out the MOAB and pinpoint laser bombs. There will be collateral damage.. but not as many deaths as there have been with this horrible regime. sure, we have all kinds of money to blow, lets keep on keeping on. Everytime Hillary gets on the Plane there goes another $500M dropped somewhere in the middle east. absolutely not, the US Government has and does support governments that are just as bad. I can't speculate as to what the US Governments ulterior motives are, but I am certain that there are. We need to worry about US, we can not even take care of our own. This coming from a OEF & OIF vet. I havnt been seen by a VA Doc for ligitimate medical purposes in over a year. See where im going with this? Lets take care of US for a little bit then worry about others. But by then, it will be way to late to intervein, wont it? There would be no military action in Syria without the United States so it's a silly question but I'll say this. When Britain and France shot off some 30 high tech missiles similar to our Tomahawk in Libya they complained they couldn't shoot anymore of them because they had already used half of what they had in stock while we shot off over 200 in 48 hours and thought nothing of it. Please, give us a more serious question about Syria. The United States should learn that as soon as one regime is toppled in the Middle East, there are others immediately looking to take advantage and institute their own political and religious ideologies that do not believe in democracy. Egypt, Libya, Iraq, Afghanistan, etc. Have things really gotten better for the people who live in those countries? It is my opinion that the United States should not intervene in a civil war. We are not the world police. If anything we should offer aid to the hospitals to help the wounded, not weapons to kill more. Yes. We represent justice in this world. If we shy away from ending the massacre then we have failed our own values. If we remember our own revolution we could not have done it alone. In order for the Military to do planning, they need every piece of information that they can get their hands and eyes on. Like Libya, the U S Military had recon troops on the ground long before we provided air support to the U. N Forces. I suspect that the Military is already on the ground in Syria and feeding information back to the Pentagon for consideration and incorporation into the planning process. While I do not advocate putting troops on the ground, if the United Nations and Arab League call for an international force to help the people of Syria defend themselves against their government, then the United States MUST provide that help. After all, how good would it look if the 'Arsenal of Democracy' were to suddenly tell these people "We cannot help you because you do not matter to us." The Assad regime says they aren't targeting civilians, but just yesterday on CNN I saw a video of a very young Syrian boy wounded by a sniper rifle's round. Not an indiscriminate rocket, not a large bomb's blast, not a falling structure, a sniper rifle. On one hand our troops just came home and our 15.4 trillion dollar debt can't afford a full scale war, but on the other hand we can't let this Iranian backed butcher continue slaughtering his people. Find the Syrian resistance groups that will support American interests, and arm them heavily. No boots on the ground. Egypt is still in turmoil as are Iraq and Afghanistan. I hate that innocents are being slaughtered but the Arabs need to take care of their own. Give the folks in power an ultimatum, knock off the genocide or prepare for your worst nightmare. Put another 100,000 troops on the ground. Spend another 2 trillion dollars to bring democracy to this poor country. Repeat the same mistakes in the past. God will we ever learn. We are not the world policeman. We need to stay out of Syria's business. Here we go again trying to put our nose in some other countries business. We have so much prejudice right here. We just need to mind our business! Where was the USA when Israeliswere slaughtering Palestinians in Gaza? Could the US stop meddling in the Middle East. You, American need another Vietnam. Remember, Saddam Hussein was your buddy. I still remember your government and the UN supporting Khmer Rouge. BTW, I like those "Syrian activists" with their perfect British accent. the u.s. should take the back seat for a change and let other nations lead on these kinds of missions.one of these days we are going to be spread out so thin ,if a war was to break out, we may have to 'depend' on some other nation to help defend us. If getting involve in Syria is truly a humanitarian call, what is that any different then helping victims of tsunamis or any other disasters? This time no Sorry Syria but the west has to look after its own interests . We can no longer afford, either unilateraly , or through the UN or NATO afford to intervene in a multitude of places . Besides Syria is a tougher proposition than Libya was small access from the Med and if there was 1 mishot the Israelis could come boiling northwards. No, no, no, no. Do not sacrifice any of our young men and women. Enough war and let's fix what's wrong with our country before we go bankrupt trying to fix the worlds problems. We would have to borrow money to fight another country's war. Three words we don't like to hear...'We can't afford it'. Course, I am a lower income lady who is still looking for Mitt Romney's safety net too. our people. I've been ther and done that. We need to learn to stay out of the middle east. They love us while we help them and hate us when we are done. It happens over and over. Same outcome. Let's take care of America for a change. Nobody else is going to. Yes, but not directly. Syria is more likely to be responsive to their friends: Russia and Iran. Maybe we should try to apply pressure there. That or tell Iran that if they don't tell Syria to stop the foolishness, we'll increse arms shipment to Israel. Big ones. Sadly, we should, the world should but we wont. The human race and the politics of nations has become so dysfunctional that we cant help other humans who suffer at the hands of a few. If we had cared for our fellow man as we should have from the get go...little or none of this type of massacre would be occurring. Syria is an opportunity to remove a conduit from Iran to Palestine and reduce instability in the region. If the U.S. is invited to participate by the Arab League, then the U.S. can do the same thing it did in LIbya, planes and bombs. Without an Arab League invititation, the U.S. should stay away. Dang! Where is that launch code? I had it just a minute ago. No. At best, we can provide humanitarian support. But definitely no boots on the ground. Absolutely not-negative-negatory. The Russians have agreed to meet with both sides and will help as necessary. Yes there should absolutely be some sort of military action. Thousands of Syrians have died already and nothing so far has deterred Al- Asad from continuing his crackdown. A U.S. military strike would help the Syrian people just like the Libyan people by just simply letting them know that they are no longer alone in this situation and that they can find the will to fight back and end this crackdown that Al- Asad has done. I would bet the Russians are tickled to death at this development and getting a chuckle out of our leadership or lack thereof. I say stay out of the dusty sandboxes from last month on. Absolutely not. Haven't we learned anything from Korea, Vietnam, Afghanistan, and Iraq? If we send troops, we're not only uninvited, but we're meddling in a country that we don't need to be meddling in. The US is facing enough big challenges of its own. Maybe, just maybe, we should clean up our own house first before we stick our noses in the domestic affairs of a country half a world away. Syria has a gov't (whether we like it or not doesn't matter) and their own problems, which they need to solve on their own. If we get involved, all of the factions in Syria will united against the invaders (US). Time to let the middle east solve their problems. Heck yeah, let's get involved and tick off a few million more people. I'm sure the Pentagon would be all for it, they seem to constantly be seeking another boogeyman so that their budget stays propped up. Jack you asked the other day if Newt was just kidding himself, I got to ask you who do you think your kidding with this one, cause I've got some new for you we are already involved planning and plotting a military solution. You can use Libya as the template and probably going end up with the same results, but even faster since this President actually knows what he's doing and our Military is the finest the world has ever known.